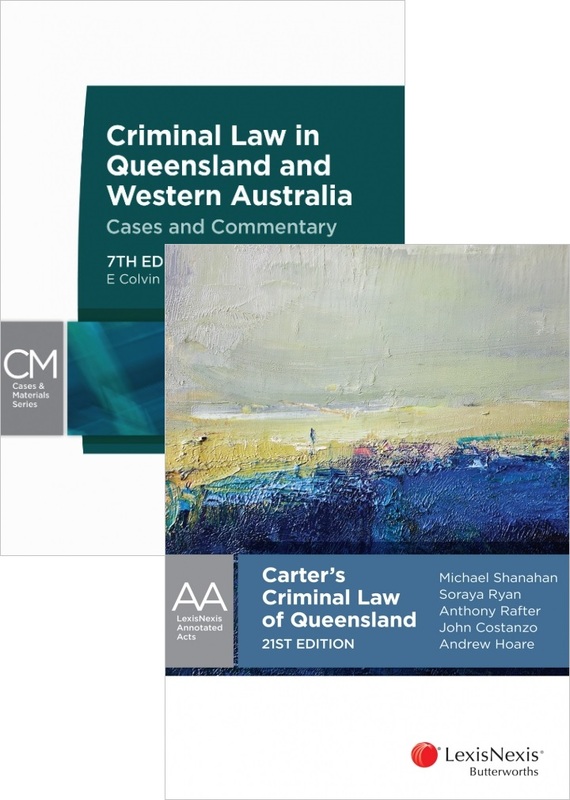 This bundle contains: Carter’s Criminal Law of Queensland, 21st edition Carter's Criminal Law of Queensland is the definitive resource for students, practitioners and anyone else who needs a sound understanding of the criminal law of Queensland. This book has an established reputation as an essential reference. Annotated by Judge M J Shanahan, P E Smith and S Ryan, it is an indispensable resource tool that provides comprehensive analysis and explanation of the provisions and relevant case law for students and practitioners. Its section-based structure and updated index and table of cases provide the reader with simple and quick access to the law. Criminal Law in Queensland and Western Australia - Cases and Commentary, 7th edition Eric Colvin, John McKechnie and Jodie O’Leary's Criminal Law in Queensland and Western Australia: Cases and Materials 7th edition covers the Criminal Codes of Queensland and Western Australia and other significant state and Commonwealth legislation together with related decisions of the courts. Although primarily designed for university law students, it will also provide a convenient aid for legal practitioners. This edition provides updated references in most chapters in light of amendments to legislation and recent case law. Specifically it incorporates discussion of and/or extracts of such recent High Court decisions as Patel (on manslaughter by criminal negligence), Moti (on abuse of process), James (on alternative verdicts) and Barbaro and Bugmy (on sentencing); decisions of the Western Australia Court of Appeal, such as Goodwyn (on self-defence) and Weggers (on attempts); and of the Queensland Court of Appeal, such as Playford (on discretionary exclusion of confessions) and Brown (on judicial independence). It also expands the analysis of areas such as committals, bail and fitness to plead.